At 9 miles by 5 miles, Jersey is the largest of the Channel Islands between England and France. An independent, English-speaking territory with a mix of British and French cultures, it's known for its beaches, walking trails along cliffs and inland valleys, as well as its defensive castles. At 9 miles by 5 miles, Jersey is the largest of the Channel Islands between England and France. 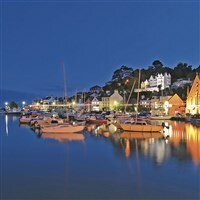 An independent, English-speaking territory with a mix of British and French cultures, its known for its beaches, walking trails along cliffs and inland valleys, as well as its defensive castles. The Jersey War Tunnel complex, in a former hospital excavated by slave labor, documents the islands 5-year German occupation during WWII. DAY 1 Coach transfer to Doncaster Airport for flight to Jersey. Arrive at Jersey Airport and local coach transfer to hotel for 5 nights dinner and breakfast. Included Full day Island Tour. DAY 6 Breakfast at hotel and local transfer to airport for return flight to the mainland. Rejoin coach at Doncaster Airport for return transfer home. The Monterey Hotel is located a short walk from the town centre. All bedrooms are en suite TV, hairdryer and tea/coffee making facilities. The hotel also boasts two swimming pools, steam room, spa bath and mini gym, restaurant and lounge bar. To comply with the CAA regulations Globe Holidays Ltd act as retail agents for Destination Specialists ATOL protected 9503. British and Irish citizens must have a form of photographic ID which proves their nationality/citizenship for immigration purposes e.g. a valid passport or full/provisional photographic driving license. please obtain suitable identification before departure.